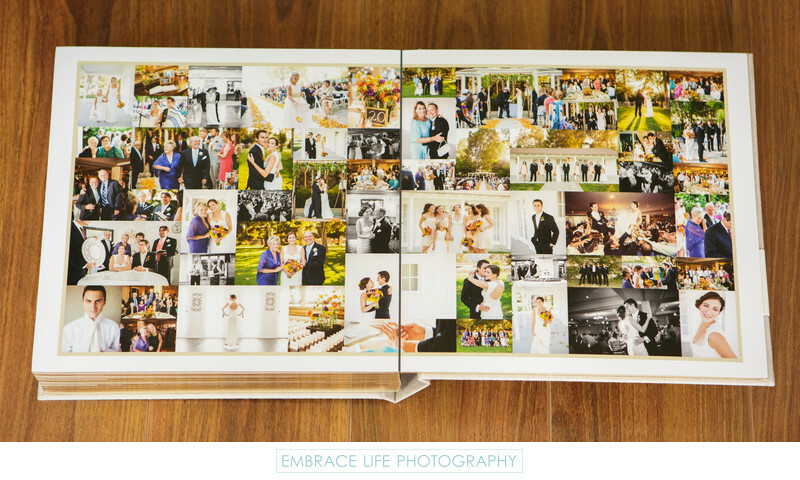 Our Hand Crafted Elegant wedding photography albums are marked by a "quiet" design style; many pages feature only one, two or three photographs. For a little splash of energy, we close our Elegant Albums with a collage of all the photographs in the album, just as we did here. These Calamigos Equestrian wedding photographs were presented in a 12x12 parent album featuring a platinum Japanese book cloth cover accented by an ivory leatherette stripe with the bride and groom's names debossed into it, ivory mats, white liner and gold page gilding. Location: 480 W Riverside Dr, Burbank, CA 91506.